Karlovy Vary is principally known for its many mineral springs, which have been used for generations as curatives. The Spa Hotel Aqua Marina Karlovy Vary offers guests access to most of the tourist and commercial destinations in the city. Karlovy Vary is small and may easily be navigated on foot or bicycle. 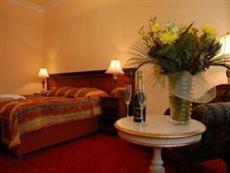 Guests of the Spa Hotel Aqua Marina Karlovy Vary may use the Karlovy Vary Airport. There is regular train and bus service from Prague, with the train trip taking approximately 3 hours. Pets and smoking are not allowed at the Spa Hotel Aqua Marina Karlovy Vary. Each of the rooms is provided with a safe, a television, newspaper service and a private bath. The private baths are equipped with bathrobes courtesy of the establishment. This establishment offers its guests its own therapeutic services. Guests of the Spa Hotel Aqua Marina Karlovy Vary may take advantage of the balneotherapy center onsite. There is a restaurant and a bar located on the premises, as well. Guests may avail themselves of practical amenities including a laundry service and dry cleaning. Sporting facilities are available.